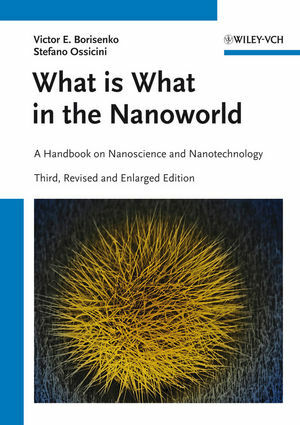 The third, partly revised and enlarged edition of this introductory reference summarizes the terms and definitions, most important phenomena, and regulations occurring in the physics, chemistry, technology, and application of nanostructures. A representative collection of fundamental terms and definitions from quantum physics and chemistry, special mathematics, organic and inorganic chemistry, solid state physics, material science and technology accompanies recommended secondary sources for an extended study of any given subject. Each of the more than 2,200 entries, from a few sentences to a page in length, interprets the term or definition in question and briefly presents the main features of the phenomena behind it. Additional information in the form of notes ("First described in", "Recognition", "More details in") supplements the entries and gives a historical perspective of the subject with reference to further sources. Ideal for answering questions related to unknown terms and definitions among undergraduate and PhD students studying the physics of low-dimensional structures, nanoelectronics, and nanotechnology. Victor E. Borisenko graduated in 1973 from the Belarusian State University of Informatics and Radioelectronics (BSUIR) as an engineer in semiconductor electronics. After gaining doctorates in physics and mathematics, he accepted a post as professor at BSUIR in 1990. He currently holds a chair at the Department of Micro- and Nanoelectronics and supervises the Center of NanoeIectronics and Novel Materials at BSUIR. His research team focuses on fundamental electronic and optical properties of semiconducting oxides and other compounds, low dimensional silicon, and germanium nanostructures. Professor Borisenko has been organizing international conferences on physics, chemistry and applications of nanostructures since 1995. Stefano Ossicini graduated in physics from the University of Rome. From 1978 to 1982 he worked as a post-doc and an assistant at the Free University of Berlin, Germany, and afterwards as a researcher at the University of Calabria, Italy, until 1984, when he accepted a post at the University of Modena. Professor Ossicini is Director of the Research Center "En&Tech? for green energies at the University of Modena and Reggie Emilia, and is an associate with the CNR-Istituto Nanoscienze S3. While his research activities have always been focused on the theory of low-dimensional and nano-systems, he now concentrates on investigating the structural and optoelectronic properties of nanostructures. About 15% new entries compared to the old edition, summarizing more than 1,500 entries. "This is a very useful handbook for the professional. It has useful definitions for terms ranging from simple to very complex. It is designed for a wide audience of professional scientists who will be experts in their own field, but may need help in understanding some terms from other areas." "... a useful and readable resource, especially for undergraduate students and those elements in the general public interested in nanotechnology." "...a useful handbook for undergraduate and PhD students as well as for teachers and researchers interested in nanoscience and nanotechnology from the physical/solid-state viewpoint. But is is also useful to chemists who are trying to move towards broader horizons." "The book is very useful to both workers in the field and those who are interested in understanding the term and expression used in greater detail and the book will make a valuable addition to any bookshelf of the interested reader. It will be of use to university teachers, managers and media professionals dealing with nanoscience and nanotechnology." "... useful to advanced graduate students beginning research projects, or to scientists and engineers reaching outside the bounds of their disciplines for work in nanotechnology." "Borisenko and Ossicini, both professors of physics, have filled a gap in nanoscience by writing this book. Overall, it promises to be a valuable source of information for scientists, researchers and research students who are dealing with materials and nanotechnology."